Immediately in front of the Sphinx lie the ruins of a small temple. Its principal feature was a colonnaded court paved with alabaster. 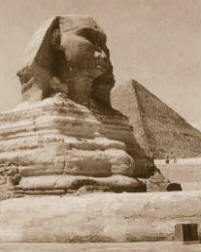 It dates from the same period as Great Sphinx statue. Built on a ground plan measuring 147 feet in each direction and rising to a height of 43 feet. Two doorways pierced the east wall, around each doorway was carved a band of hieroglyphic inscription giving the name and title of the King, but only the last words "beloved of (the Goddess) Bastet and beloved of (the Goddess) Hathor are preserved, no other inscriptions or relieves occur anywhere else in the building.The Pharaoh Tuthmosis IV, ruled during Egypt famous 18th Dynasty, and created the largest obelisk ever made which is now on display at the Vatican in Rome "Now the statue of the very great Khepri (the Great Sphix) restin in this place, great of fame, sacred of respect, the shade of Ra resting on him. Memphis and every city on its two sides came to him, their arms in adoration to his face, bearing great offerings for his ka. One of these days it happened that price Tuthmosis came traveling at the time of midday. He rested in the shadow of the great god. (Sleep and) dream (took possession of me) at the moment the sun was at zenith. Then he found the majesty of this noble god speaking from his own mouth like a father speaks to his son, and saying, 'Look at me, observe me, my son Tuthmosis. I am your father, Horemakhet-Khepri-Ra-Atum. I shall give to you the kingship (upon the land before the living)... (Behold, my condition is like one in illness), all (my limbs being ruined). The sand of the desert, upon which I used to be, (now) confronts me; and it is in order to cause that you do what is in my heart that I have waited."